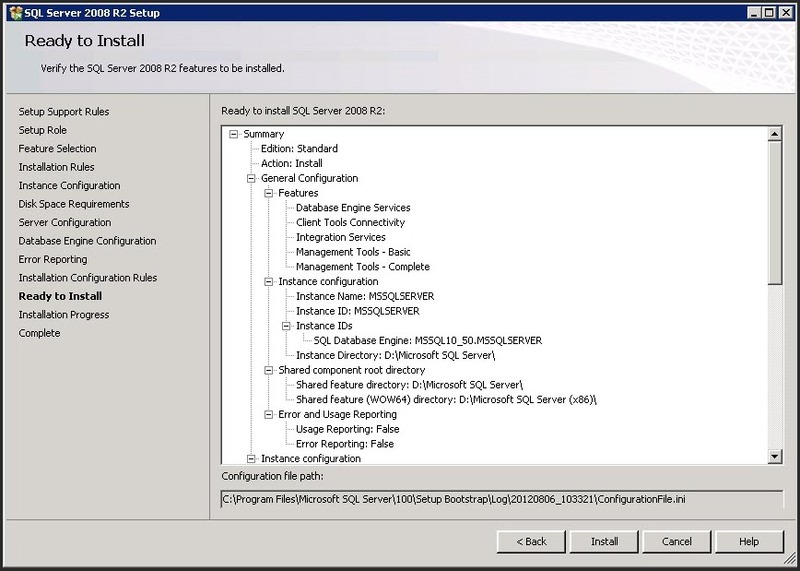 In this post I provide a step by step installation guide for MS SQL Server 2008 R2, which provides a database for VMware vCenter. This guide also applies for other VMware products like Site Recovery Manager (SRM), VMware Update Manager (VUM) etc., which requires a database. During the next days a second post will follow and guide you through the database configuration etc. Please note that I´m not a MS DBA professional. Most of my knowledge for SQL Server I acquired by learning by doing over the years and reading some manuals and guides. 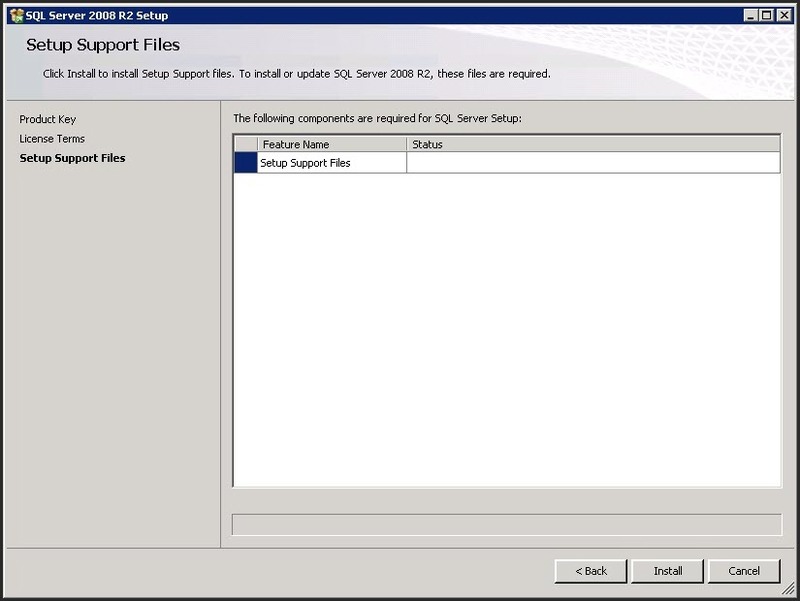 Before you start with the installation you should check the Product Interoperability Matrixes, to verify which version of the SQL Server is supported. 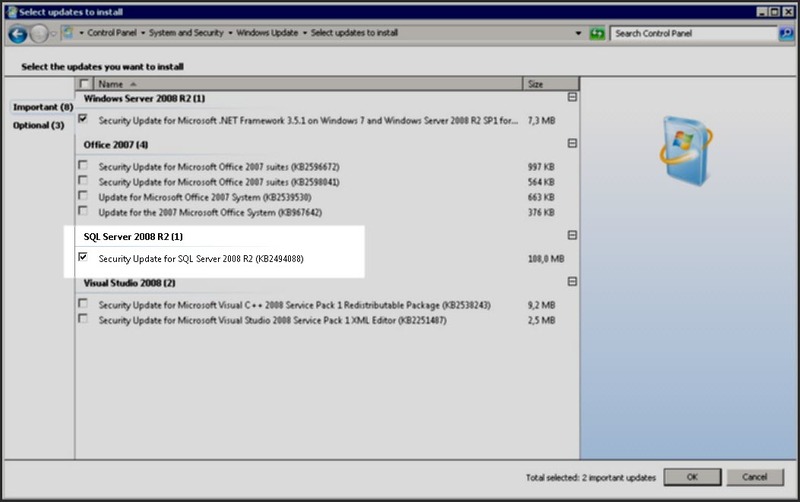 As of today (22.08.2012) there are no service packs listed for the SQL Server 2008 R2. 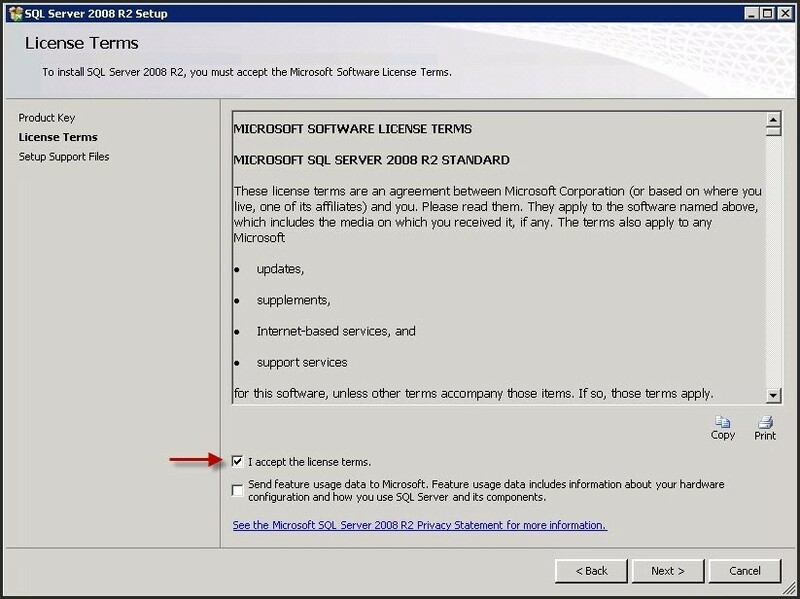 Even if have seen installation with SQL Server 2008 R2 SP1 running totally fine, I would suggest you to just use versions which are listed as supported. You should install the database on a separate disk. 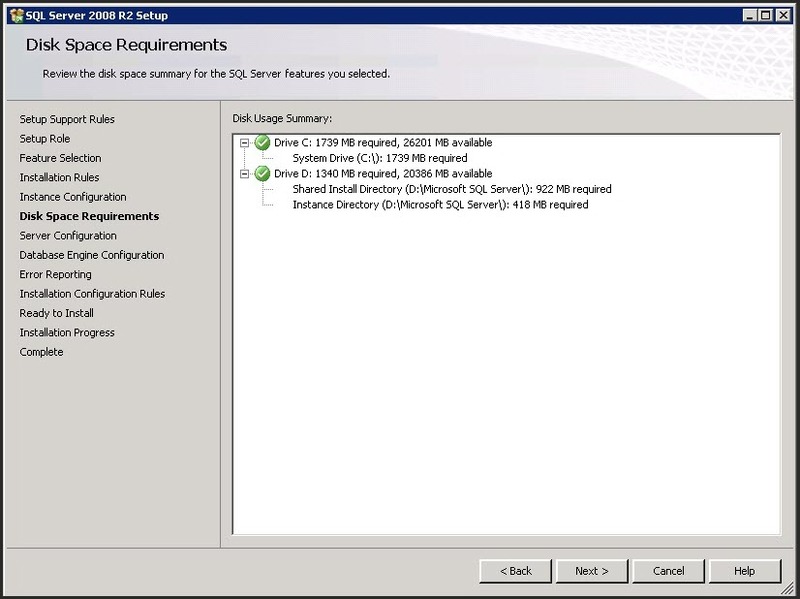 For large installations it´s recommendable to use also separate disks for logs, tempdb & backup. 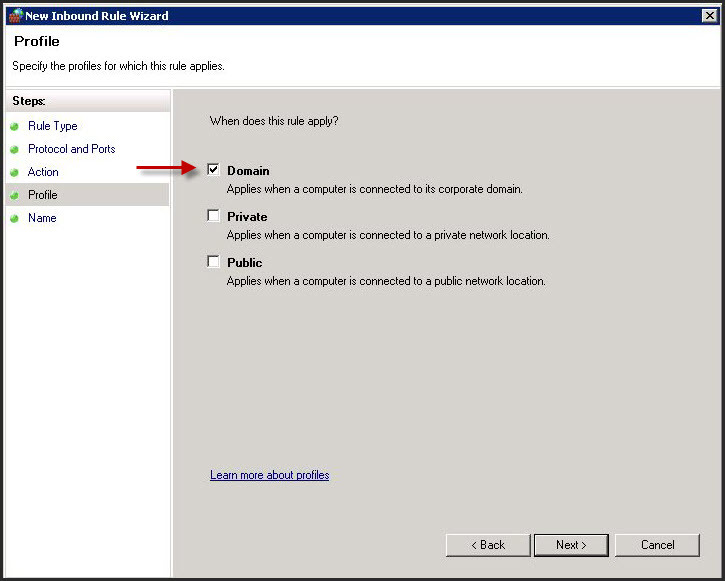 To be able to select this during the setup of course you need to make sure you have the additional VMDK(s) attached to your VM and configured in Windows. It is a best practice from Microsoft to format these disks with 64KB (see also: http://technet.microsoft.com/en-us/library/dd758814%28v=sql.100%29.aspx). 1.) The first thing I like to do is to create a separate SQL user account, because I don´t want the SQL service to run with admin privileges. So I just create a new user like shown on the screenshot. I want to disable, that someone could directly login with this user into Windows. Therefor I go to “Local Security Policy” and below “Local Policies” –> “User Right Assignments” I add my sql_user to the policy “Deny log on locally”. 2.) When you start the setup of the SQL Server your system gets checked if you already installed the Microsoft .NET Framework. If not you just need to click OK and the needed role gets enabled. 3.) Before we start the installation process I think it´s always a good idea to run the “System Configuration Checker…. 4.) 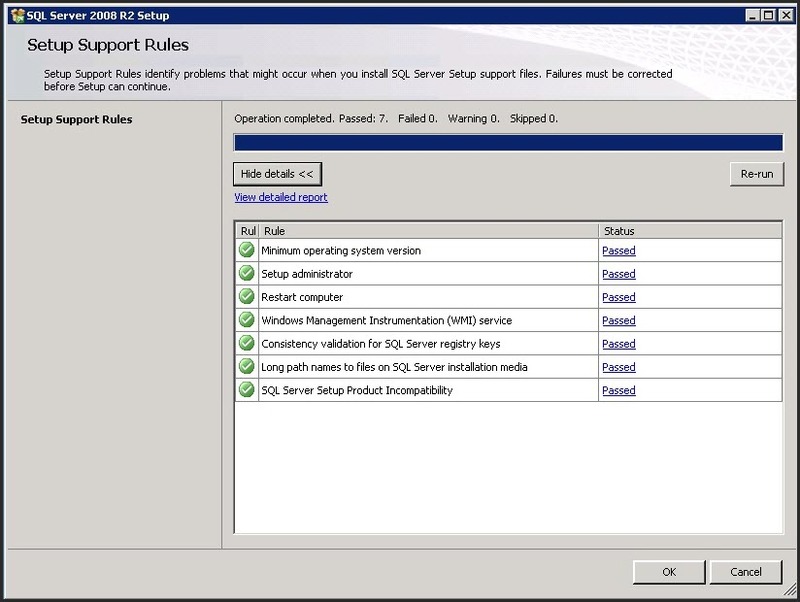 …which verifies that your system has no problems to proceed with the SQL Server installation. If the check reports any errors you should make sure to solve it before. 5.) 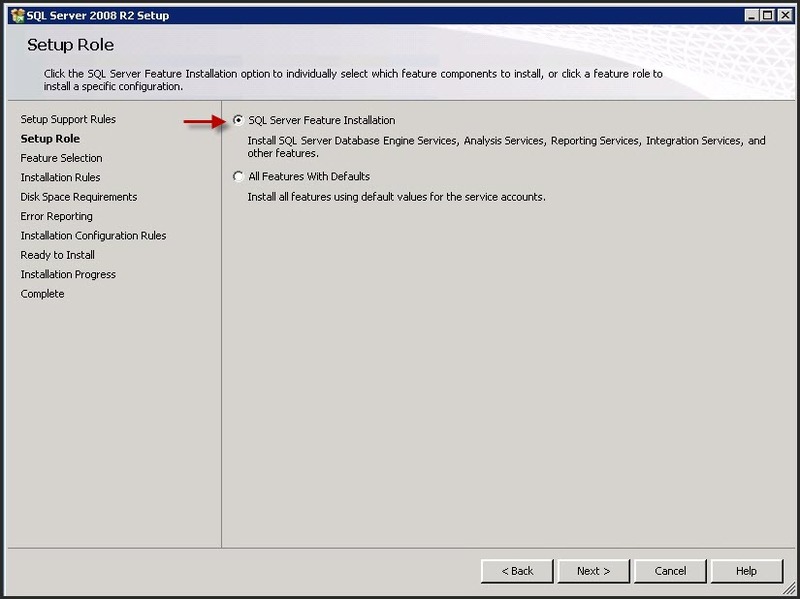 After you passed the Configuration Checker you are now ready to begin with this installation. 6.) Again your system gets checked, but this test is less comprehensive than the first one. So if you passed the Configuration Checker you should also get “Passed” as a result here. 7.) In the next window you need to enter your product key. Alternative you can start a 180-day evaluation mode. 8.) You need to accept the license (of course at first you should read it 🙂 ) and click Next. 9.) Click install to install the Setup Support files. 10.) Again the setup runs some additional checks. 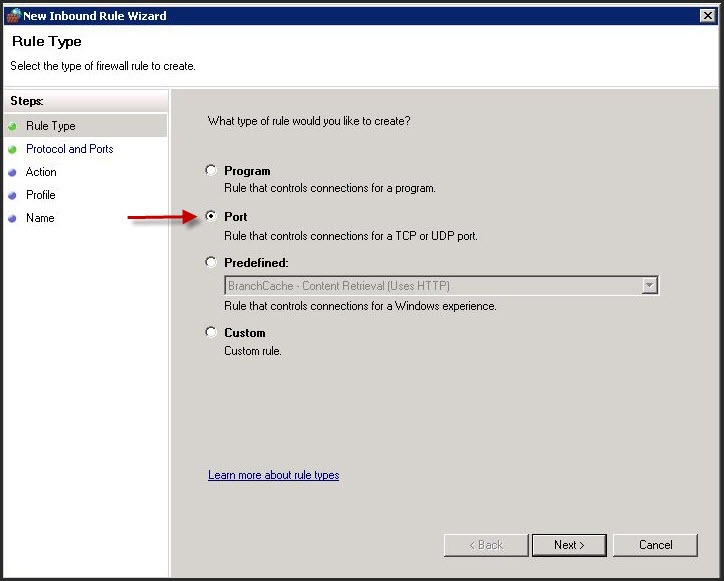 Please note that if you didn´t turn off the Windows Firewall (and didn´t to any SQL specific customizations) you will get a warning for this rule. No reason to worry at this point, we can configure the firewall later. 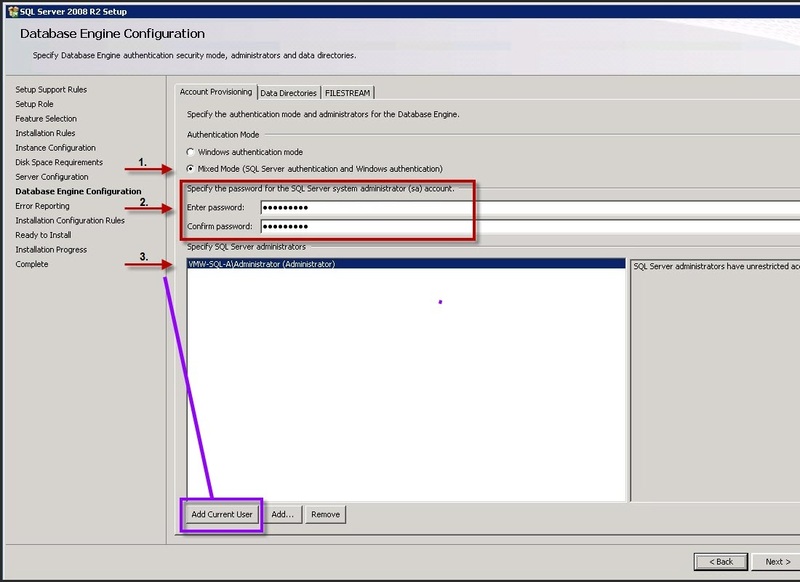 If you are running vCenter and the SQL Server on the same server (maybe in small environments) it isn´t necessary to do any changes on the firewall at all. 11.) 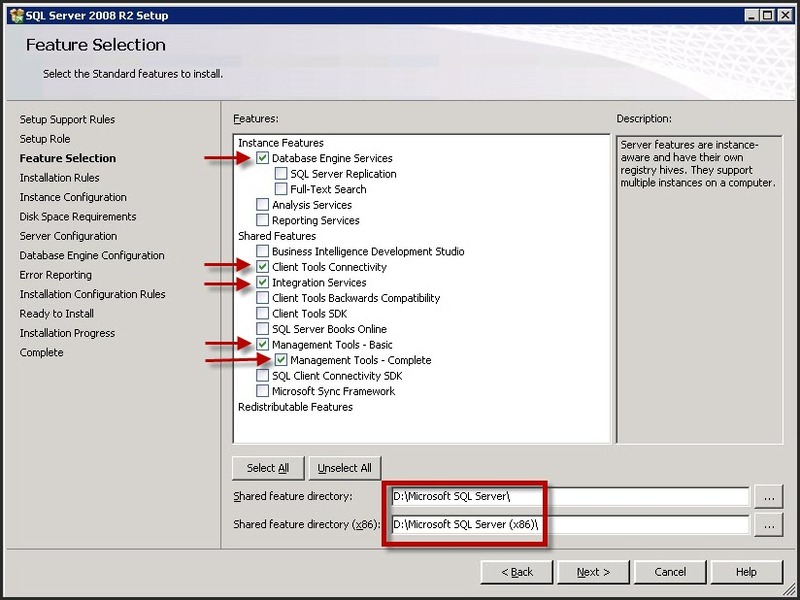 In the next window we select the “SQL Server Feature Installation”, because we don´t want to install all features. 12.) I always select the features shown on the screenshot. If you want to install the database on a separate disk (like suggested before) it is very important to change the directory at this point (see the red box). 13.) And again some tests to make sure you can continue the setup without any problems. 14.) 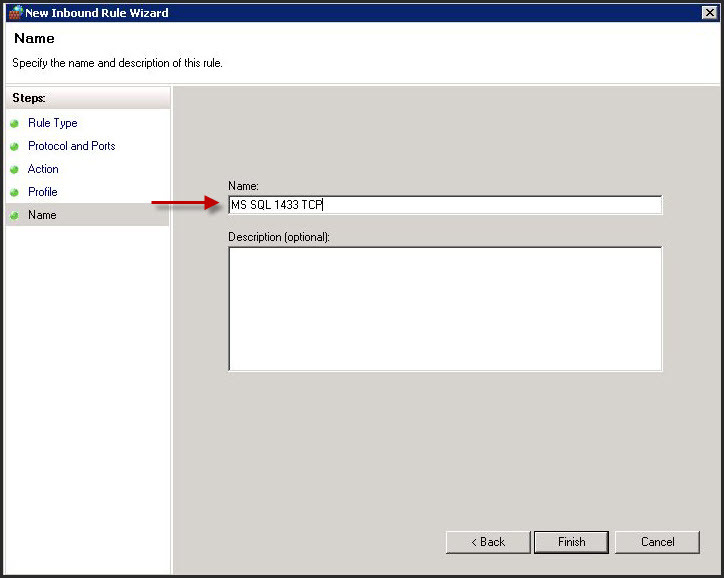 The following step asks you for the instance ID. 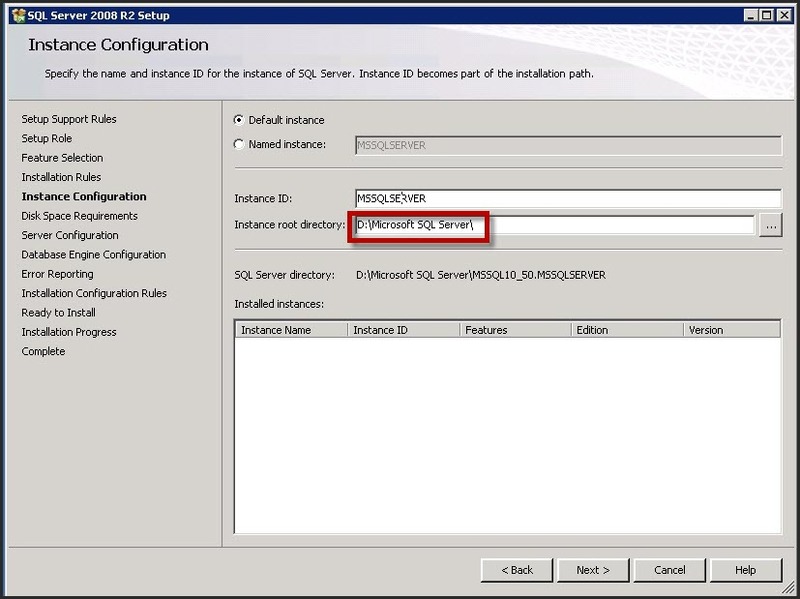 If you are not running any other SQL Server installation on this server, there is no need to change the default instance. Again it´s important here to change the directory to your dedicated disk. 15.) Now you get a short review of the disk space which is needed. 16.) Now we need to specify the user accounts and the startup type of the different services. Click the button “Use the same account…“ …. 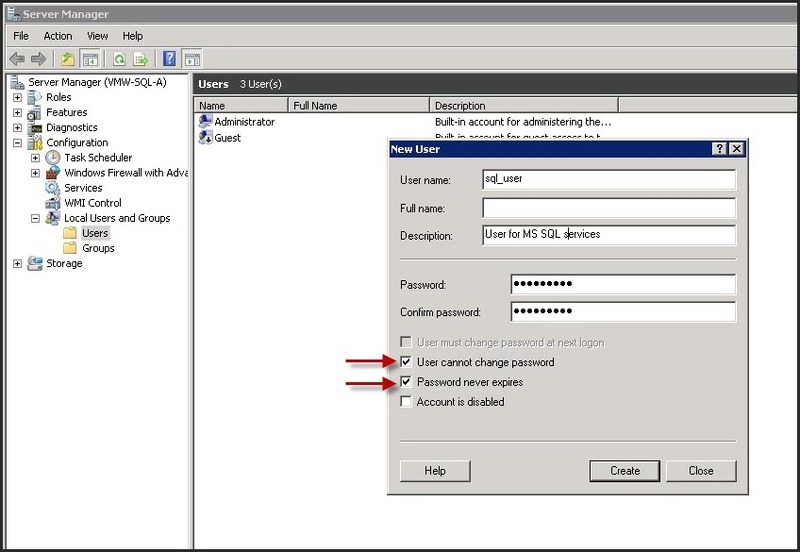 ….and provide the user account credentials we created in the first step. 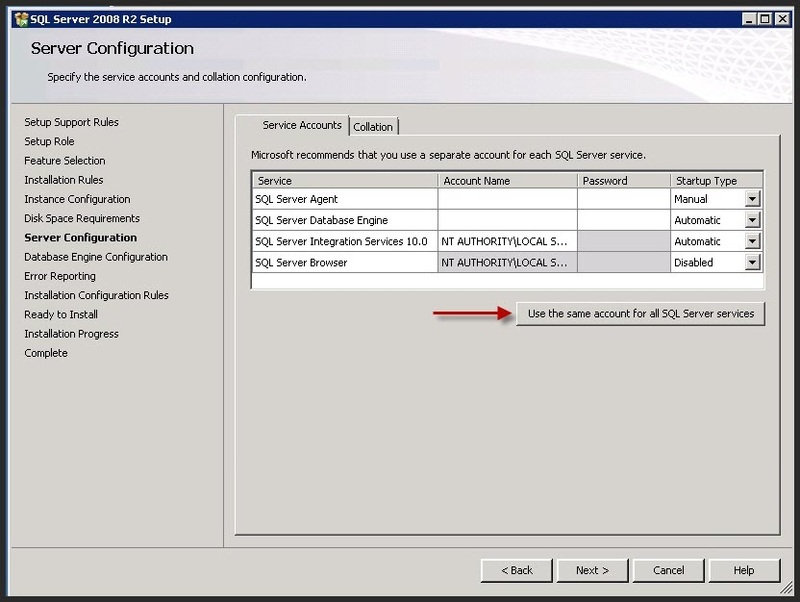 Before you click next you need to make sure the startup type of the SQL Server Agent is set to “Automaic”. 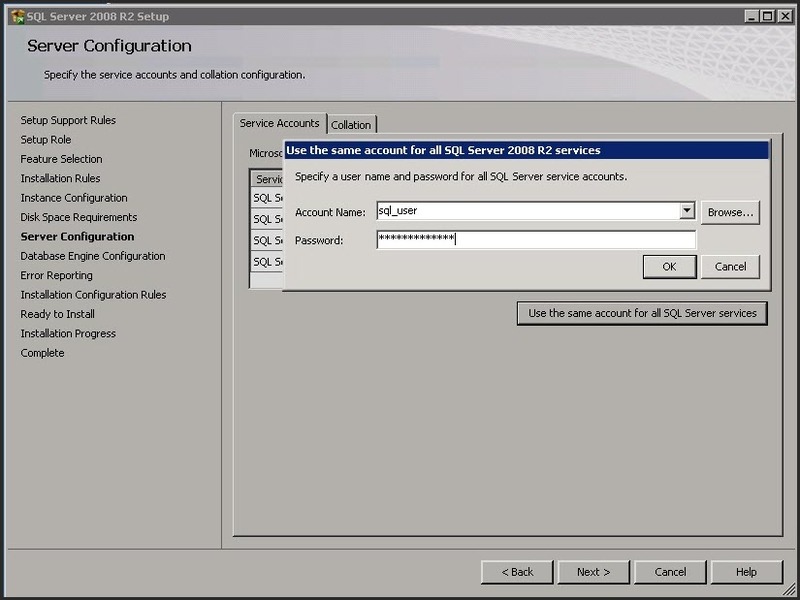 On the other hand you should verify that it is set to “Disbabled” for the SQL Server Browser. …you should click the Tab “Data Directories” and verify that all paths pointing to your separate disk. If you want to use separate disks for logs, tempdb and / or backup (like mentioned on the beginning), that´s the point where you need to configure the relevant paths. 18.) On the Error Reporting section you have now the option to send reports directly to Microsoft (Who don´t want this 🙂 ?). 22.) 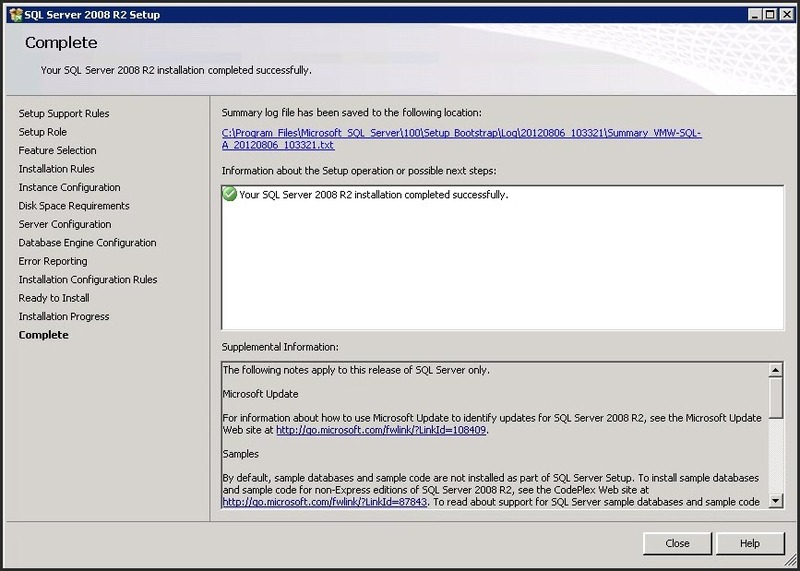 After you are done with the installation you should check your Windows Updates for some SQL Server related updates. 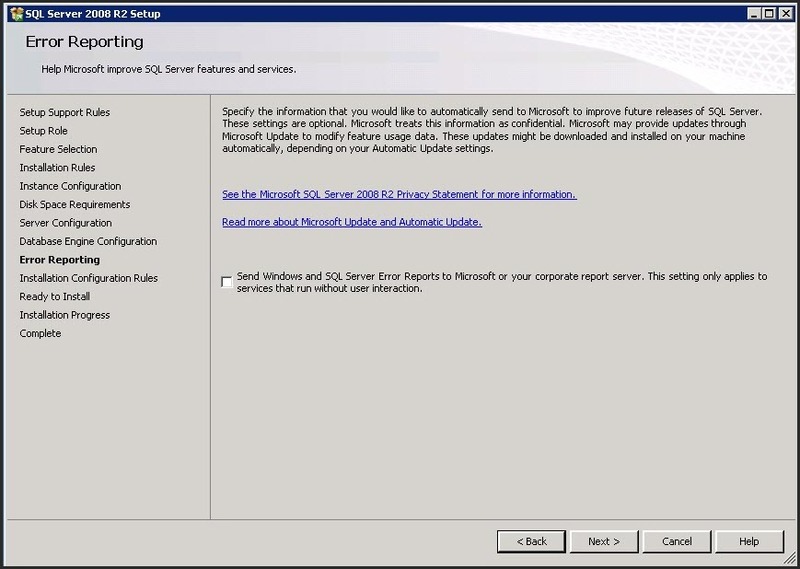 You need to be careful because Windows offers you also the latest service packs, which are may not supported by VMware (I mentioned this on the beginning of this article). 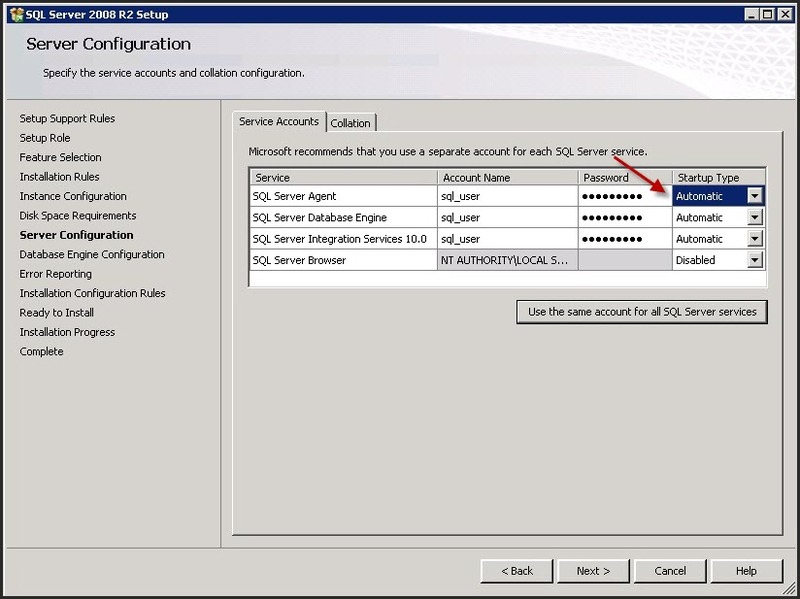 Note: The following steps are just needed if you are using the Windows Firewall and need to get access to your SQL Server from an external server. 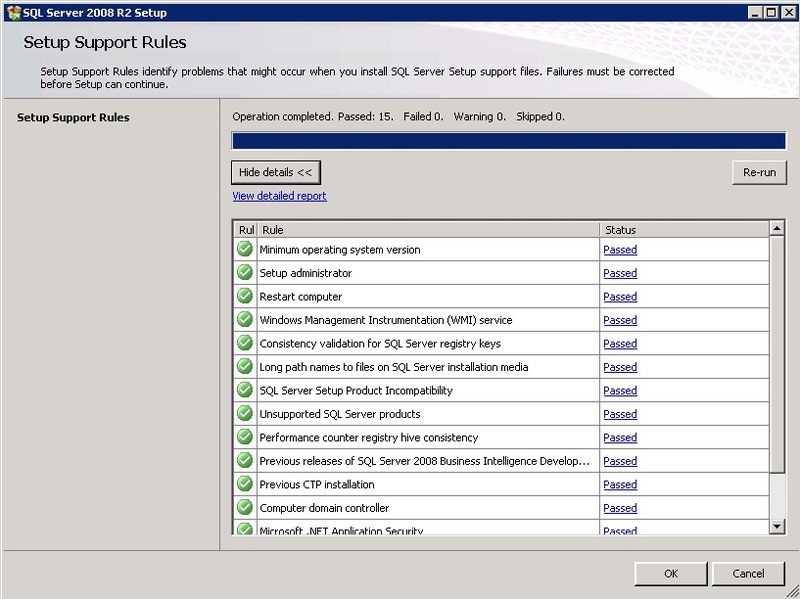 A common use case would be if you having you SQL Server and vCenter Server installed on separate VMs (also VMware best practice). 23.) Open the “Windows Firewall with Advanced Security” section. Select “Inbound Rules” and then click on “New Rule” on the right. 24.) 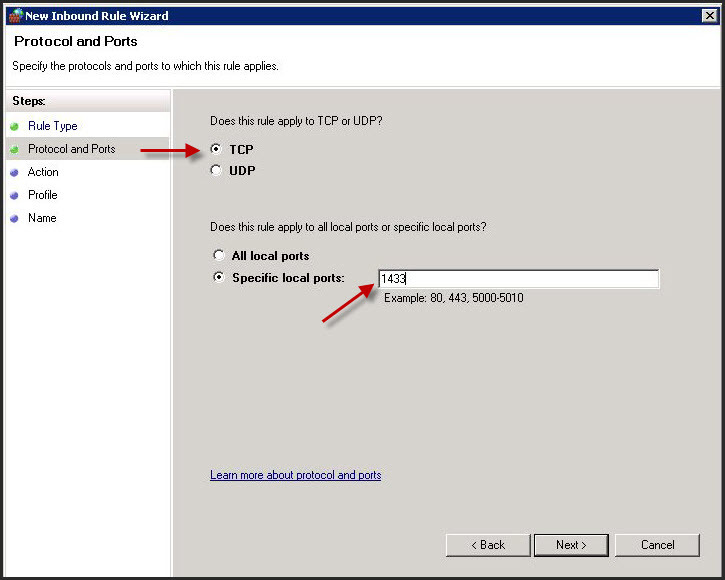 In the pop-up window you need to select “Port”, because we are going to open a specific port for the SQL Server. 26.) 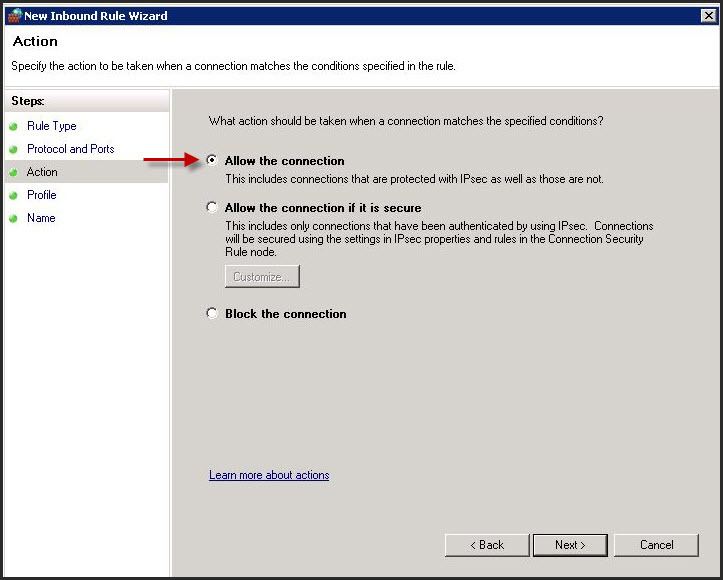 And of course we need to “Allow the connection” for the port we specified before. 27.) If the external server (e.g. 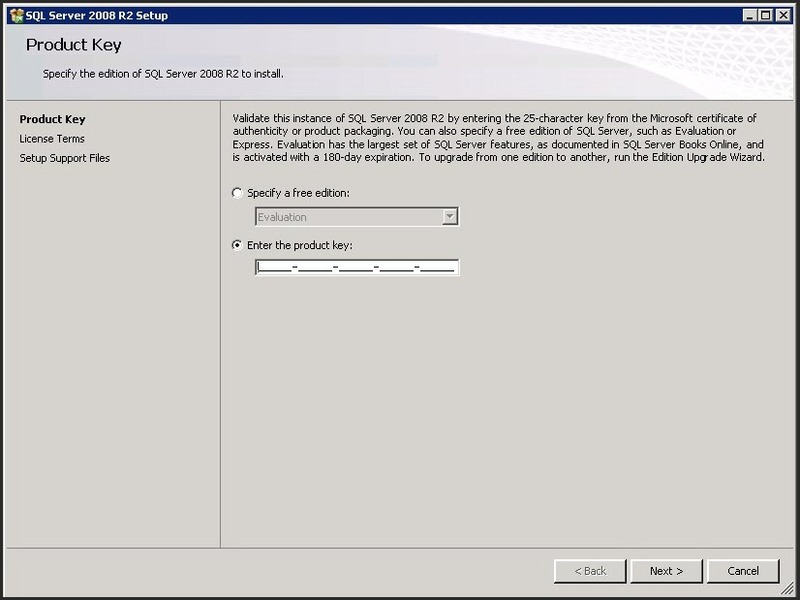 vCenter Server) resides in the same domain like your SQL Server you should only select “Domain”. 28.) And in the last step just enter a name for your new rule and click “Finish”. 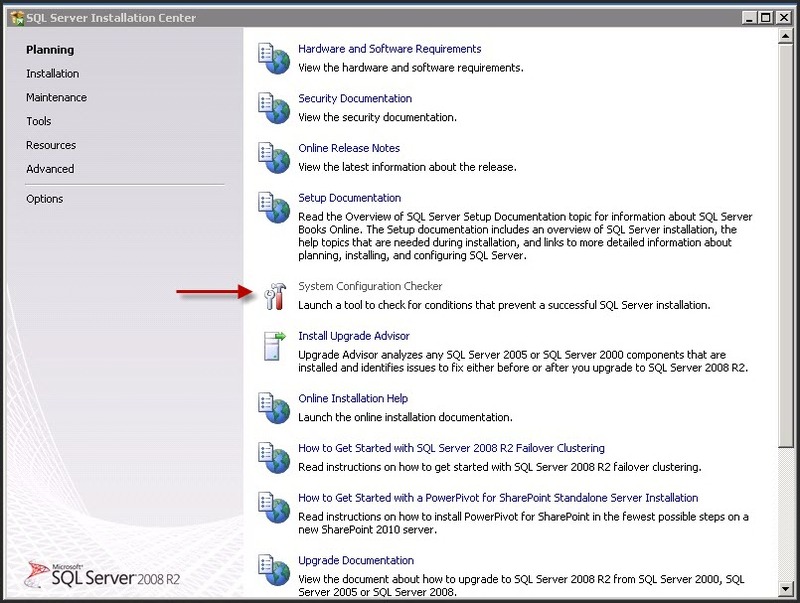 If you are new to MS SQL Server I hoped this guide may helped you to get through the setup with all its steps. Please note that there can be some more complex uses cases, which may requires more features to be installed etc. This guide here was “just a basic installation”, which should meet the requirements for most of the vCenter databases. This is by far one of the most useful posts I have found in regards to SQL DB setup for Vmware. I found a lot of half cooked links with useless out dated information but this post is dandy. a dandy indeed….. Very well put together! Absolutely the most useful article i have come across. It was a great help. Thank you. Thanks! Nice to hear it helped you! I did not see any collation mentioned. 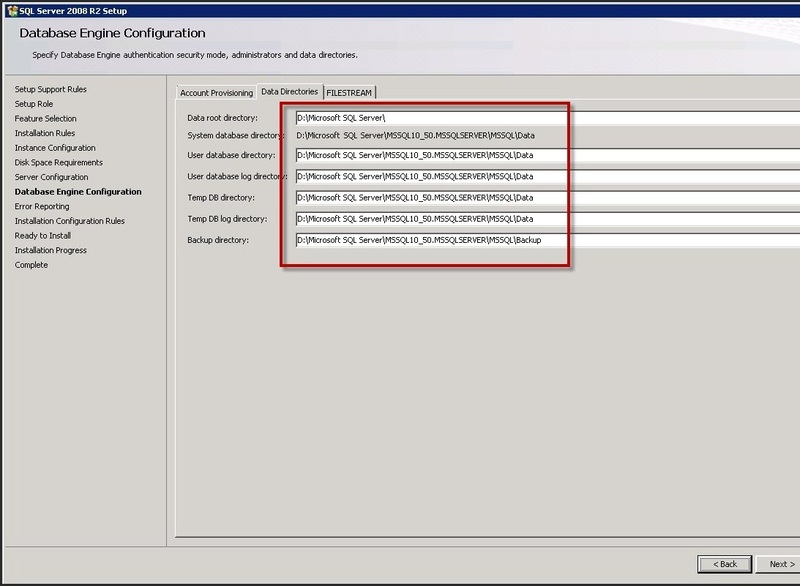 Is there a specific requirement for the collation on SQL Server? For instance “SQL_Latin1_General_CP1_CI_AS”. thank you for sharing this, very well explained! cheers! I’m years late but….I have to say, this is better than anything on the MS or VM website! Superbly documented, complete in it’s outline and very thorough…from SQL to VM, beginning to end. I’m new to this and I have to say, for all the noobies out there this is invaluable! vMario kudos.